Acrylic (Polymethylmethacrylate), known by its brand name Perspex® or Plexiglass®, is a clear plastic that resembles glass, but has properties that makes it superior to glass in many ways. With UV stability and a good temperature resistance, acrylic can operate in temperatures ranging from -40°C to approx. +70°C. There are some misconceptions about acrylic, namely that it yellows, turns brittle and cracks over time. However, if taken care of, acrylic remains new looking regardless of age or exposure to sun. Acrylic is resilient against even the harshest of weather elements and is easy to polish; scratches can be easily buffed out of acrylic. The good mechanical strength, tensile strength and hardness of acrylic allows for its use in very demanding environments. For example, the fighter planes of WWII have acrylic bubble-tops and commercial airliners have acrylic windows. 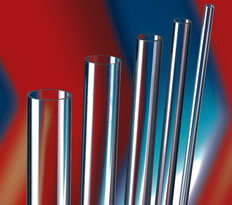 Macplas LTD is able to supply a range of Acrylic solutions in rod, sheet and tube form.